I should not go into Sephora unsupervised. I know this, I promise I do, but I often break my own rules for the sake of potential beauty. While at The Galleria, otherwise known as shopping nirvana in the Houston area, I decided to pop in Sephora to check out Smashbox foundation because I'd heard raves about it. My motives were pure, I just wanted a peek, my visit promised to be brief. Scott and Annelise made a beeline for a fishtank (?) and I made a beeline in pursuit of flawless skin. As I stood in front of the Smashbox display, pondering switching from the lightweight Bare Minerals makeup I have worn for the past two years to a primer and cream to powder foundation applied with a brush (?) for supposed airbrushed perfection, I heard a voice ask me if I needed any assistance. I replied that I did and told her my interest in Smashbox. Looking back I think I saw dollar signs light up behind her pupils. Before you could say beauty is in the eye of the beholder, my hiney was perched in a chair at the entrance to the store and she was wiping off my existing *face* so she could apply the Smashbox to one side and another miracle she recommended, Stila One Step to the other. I quickly realized I had fallen into a Stila lair and Smashbox didn't really stand a chance. Short story longer, I soon had a face full of Stila product and found myself numbly nodding as she pulled selections from the shelf to fill my basket. At that moment the brushed on foundation felt light and looked natural. The lip stain she applied was more pink than I normally wear but she encouraged me to try something new, so I did. There may have also been a palette of eyeshadow that walked out with me too. Did I really think I'd wear bright blue eyeshadow? No. But she told me how fun it would be to experiment with all of the colors, so... I bought it. I think I heard a small voice whisper SUCKA. I am a weak woman easily distracted by color and glitter. I walked out of the store, still somewhat in a daze, and stumbled upon my people who had almost given up on me. By the time we got home my face was feeling, um...heavy. I applied some powder and felt even heavier. I refreshed my lipstain and gloss and cringed at the bright pinkness of my lips. I felt like I was wearing a waxy mask and began to suffer strong pangs of buyer's remorse. What had I done? Why did I listen to That Stila Woman (no offense)? What am I really going to do with 32 different eye shadows? I don't have time to paint on my foundation with a brush every morning...who does that anyway? Then I took a closer look at my receipt and noticed Sephora's broad return policy. Obi-One Kanobi, it was my only hope. I explained my mission to my people to see if they wanted to accompany me, since they are such good sports (and there's a Build-A Bear directly opposite our Sephora) they agreed. I explained my woes to the girl behind the counter, telling her I truly was a Bare Minerals girl at heart and didn't like the feeling of Stila after all (no offense), that I did open the lip stain, gloss and eye palette but not the other items and was hoping I could return at least what I hadn't opened. Then she uttered a magical sentence, "It's all right, would you like to exchange ALL of these items for something you would use?" I picked out a new Bare Minerals Mineral Veil and Skin RevverUpper, along with two new Buxom (I know!) lip crayons and glosses, because it's my personal motto that a girl can never have enough lip gloss, and I got a refund for the rest. The girls at Sephora were very helpful and didn't make me feel guilty for changing my mind (even after trying some of the product) over an impulse purchase barely five hours earlier. I hope the SUCKA on my forehead has finally faded. Oh my goodness - it happens to me all the time! Most recently it was a Mary Kay party. I bought a few things that seemed to be perfect at the time only to get them home and they just didn't feel right. I love that Sephora exchanged everything! I am a bare minerals girl at heart... LOVE the buxom lip glosses. You crack me up! 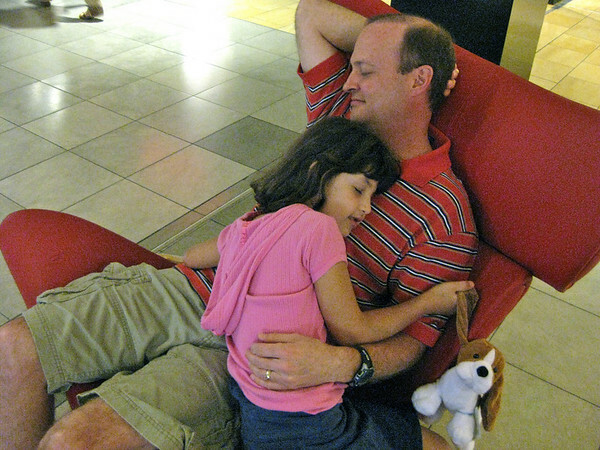 I used to have some good times at the Galleria back when Luci was my only child. I'd meet my family there for the day since it was only 3 hours from san Antonio and 5 hours from new Orleans. My only stipulation about makeovers is that they be done by a male. I always have the best luck that was as far as liking what they suggest. I use a mixture of MAC and Lancome products and I don't do well switching brands either. Hilarious! The same thing happened to me on vacation in NYC a few years ago. 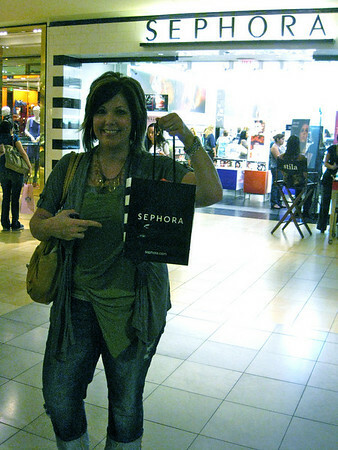 My only problem is that there was no Sephora store locally that I could return the product too. I think I used their suggested foundation once. It still sits under my sink as a reminder of my foolish impulse buy. You had a lot of great lines in this post Holly, it was a fun read. It is usually tight funds that keep me from falling prey to crafty sales women, but earlier this year I spent $40 on a bottle of cleaning fluid because the sales man was so persuasive and entertaining. Thankfully, I actually like the stuff so I have no remorse, but still $40! Oh, Holly! You are a woman after my own heart! I love, love, love, makeup! Too many stories to tell, but one that stands out... When I was a single 20-something, career girl, I got a new auburn doo and decided to get makeup to enhance the look. Well, the makeup counter girl and guy really liked the look of carrying the auburn color through to my eye, lip and blush. I liked it, too. Well, not long after I walked in to my hair stylist (another guy) and he immediately sent me upstairs to the makeup area and told them they needed to work on me. Seems he hated the tone on tone, matchy, matchy of hair color and makeup color. Looking back, he was probably correct, but it sort of set me back, if not partially offended me. Oh well. Live and learn.